This is a Slider Script that could be used both for creating sliders and galleries. It is one of the most flexible slider scripts. This script is initialized with a <div> element with #loopedSlider id. 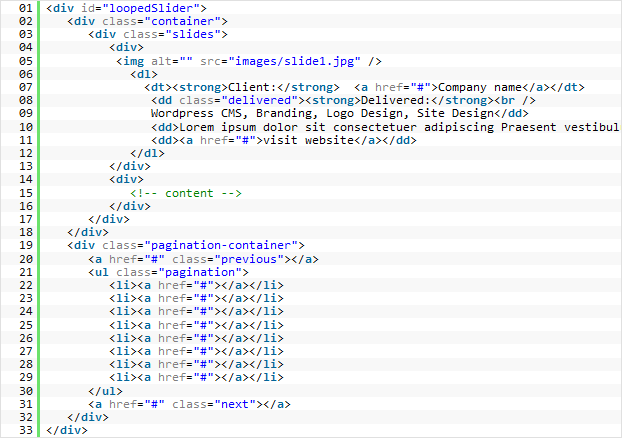 Bulleted list (<ul> tag) with the .pagination class defines pagination output for the slider (or a gallery). For loopedSlider version 0.5.4 and lower you have to add correspondent number of anchors (<a> tags), each slider should have a correspondent anchor. For loopedSlider version 0.5.5 and newer the plug-in will add necessary scripting automatically. Make sure to set the same width value for .container and .slides div styles.